Delicious smells of cookies, muffins, cakes, and breads wafted through the air at IBIE 2016 in Las Vegas, Nevada. Manufacturers and suppliers representing nearly every facet of the baking industry showcased their latest and greatest offerings over the course of the 4-day show. 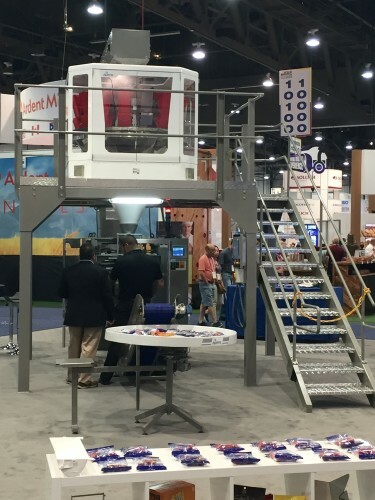 The Masipack team was at Booth #9809 in the Central Hall of the Las Vegas Convention Center, and featured one of our bagger complete systems, featuring assorted candy as the product, as well as our Big scale. international customers and new attendees as well. We are pleased with the outcome of the show, and were fortunate to have the opportunity to both catch up with customers and meet new attendees with whom we look forward to working. Trade show season continues… Next up, Pack Expo International, the world’s premier processing and packaging trade show, in Chicago, IL, November 6-9th. End-user and retailer registrants, please click on this link to receive complimentary access to the show. We’ll have another article on our website soon with exciting information about our participation in Pack Expo… Stay tuned!